Abstract : We present an algorithm that approximates 2-manifold surfaces with Zometool models while preserving their topology. Zometool is a~popular hands-on mathematical modeling system used in teaching, research and for recreational model assemblies at home. This construction system relies on a single node type with a small, fixed set of directions and only 9 different edge types in its basic form. While being naturally well suited for modeling symmetries, various polytopes or visualizing molecular structures, the inherent discreteness of the system poses difficult constraints on any algorithmic approach to support the modeling of freeform shapes. 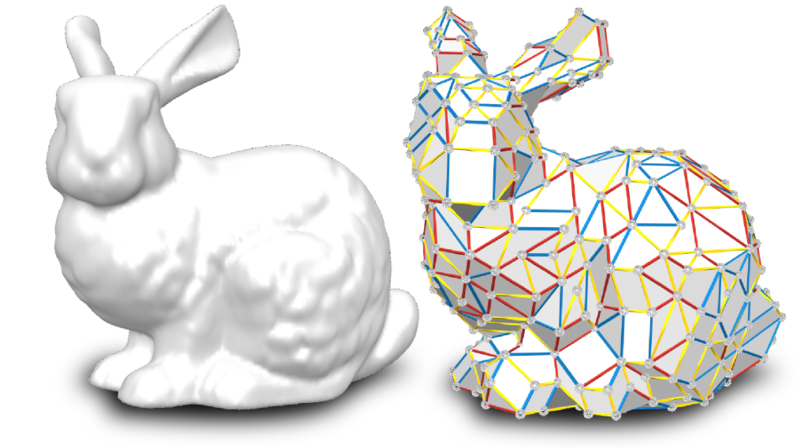 We contribute a set of local, topology preserving Zome mesh modification operators enabling the efficient exploration of the space of 2-manifold Zome models around a given input shape. Starting from a rough initial approximation, the operators are iteratively selected within a stochastic framework guided by an energy functional measuring the quality of the approximation. We demonstrate our approach on a number of designs and also describe parameters which are used to explore different complexities and enable coarse approximations.